Words on Cricket: Selection of injured players continues in Indian cricket. Selection of injured players continues in Indian cricket. Disaster of England tour is still fresh in the minds of Indian cricket lovers but I think Srikkanth led selection committee and BCCI have forgotten that disastrous tour of England and that's why they again repeated the mistake by sending injured Ishant Sharma on the all important tour of down under. How often we see injured player travels with the team and enjoy the paid holiday from BCCI. 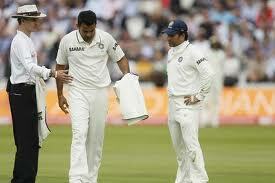 Zaheer khan returned from the tour of England after bowling just 2 overs in the test match at Lords. Zaheer failed to complete the tour down under twice in the past and this time also scene is not that great as well. It is good that Harbhajan is not selected for this tour otherwise one more injured player had travelled with the team. Recently it is revealed that Harbhajan is carrying the shin injury for long time and he will going to miss out entire Ranji season for Punjab. Actually BCCI don't have any plan in place to control the injuries to its key players. Cricket fan can understand that injuries cannot be controlled but BCCI can atleast take an initiative that injured player don't board the plane for the important tour. But that is also not happening. Every player try hard to get selected despite injuries and eventually fan suffers due to below par performance of the team.I think time has come to punish the players who hide their injuries and make themselves available for selection. Recently Anil Kumble resigned from the post of Chairman-National Cricket Academy because board didn't accepted his injury management programme. So it is clear that BCCI is not serious about injury management. Not accepting Kumble's word is disaster because Kumble is legend and he hhas played cricket at highest levels and knows all about injuries that hampers the player's career. Even after getting to know that Ishant is not fully fit, he has been not replaced and board allowed him to continue on the tour. What happen, if Ishant play first test in Melbourne and breaks down after one or two over? Just like he broke down and left the ground in Canberra practice match where he just bowled 5.3 overs and for rest of the match he was sitting in dressing room with his troubled ankle. Even team manager Shivlal Yadav also lied to the media and fans, stating that Ishant was supposed to bowl only six overs. What kind of excuse is this? I remember, when Greg Chappell was hooted by the Indian fans he showed his middle finger which created lot of anger among fans, but the BCCI, Vice-President Rajiv Shukla gave senseless statement in favour of Greg Chappell that finger of Chappell had some pain and he was trying to cure his finger by raising it. Such senseless statements are regular from BCCI officials and selectors in defence of their acts. If we hear some senseless statement from K.Srikkanth about Ishant's injury, we will not get surprised at all, because we Indian fans are ready for such senseless statements. When India returned from England this summer, selectors clearly said that they will pick up only fit players for the next tour but they again repeated their mistake and picked up injured player like Ishant Sharma for the series against West Indies where Ishant performed below par and picked up just 9 wickets in 3 test matches. Everybody knew Ishant picked up ankle injury on that England tour, yet selectors selected him.Selectors still had that chance to test the Ishant Sharma ahead of all important Australia tour by asking him to play in Ranji game during ODI series between West Indies and India but selectors failed to do so and that's why injured Sharma is on that tour. Now Indian bowling looks hopeless as there is question mark on Zaheer's fitness as well and only solace India have in bowling is new pace sensation Umesh Yadav. Abhimanyu Mithun and Vinay Kumar failed to impress in the first practice game at Canberra. I think Ishant must be recalled and Irfan Pathan must replace him immediately as latter is in good form and rythm while former is injured and don't look good to complete the tour. In the decade of 90s, injured players were easily got selected for the matches because of their good relations with then physio Dr. Ali Irani who always recommended injured players for selection just on the basis of relationship and that's why he was fired from the job and foreign physios took over but trend still continues and injured players are still finding place in the team and in-form players are ignored. I am not at all hopeful of India doing well down under this summer as well, where they failed to win single test series in past and this is just because of wrong selection. I hope BCCI wake-up before its too late.